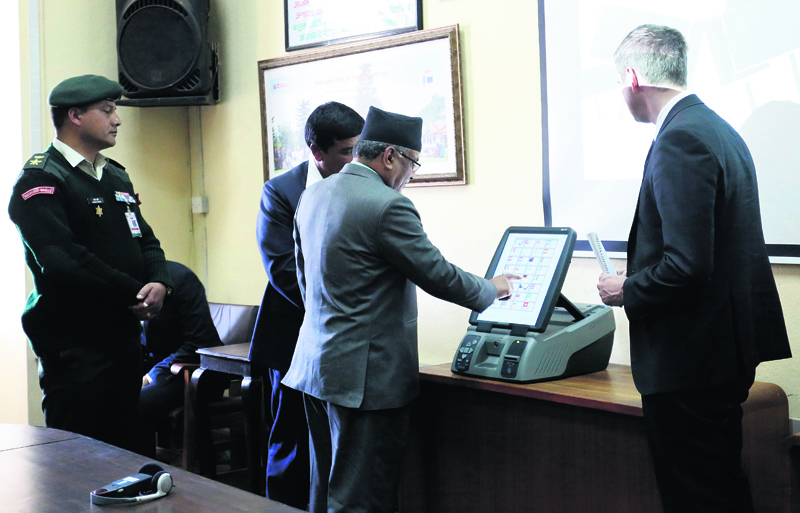 Dipesh Shrestha/Republica Prime Minister Pushpa Kamal Dahal (center) inspects an electronic voting machine at the Election Commission at Kathmandu, Tuesday. KATHMANDU, Feb 8: While some lawmakers are cautious about the use of electronic voting machines (EVM), Prime Minister Pushpa Kamal Dahal is strongly advocating their use in upcoming polls. Speaking at a function organized at the Election Commission (EC) to demonstrate the use of EVMs from the UK-based firm Smartmatic, Dahal said technology is a must for the conduct of elections in a free, fair and credible manner and for minimizing election expenditures. "When I reach different parts of the country including the remotest, people take photos with their cell phones. One should not think that Nepalis are unaware of technology," said Dahal, adding, "So, they can easily use electronic voting machines also." At the function, Robert Dobler, vice-president of Smartmatic, briefed those present on the EVM's features and demonstrated its functioning. "It cannot be hacked and it has already been used in various countries including the USA. We have designed these machines especially for your country Nepal," said Dobler. Also present at Tuesday's briefing were Chief Election Commissioner Ayodhee Prasad Yadav and senior leaders from the major political parties. With the local elections on the horizon, the EC is mulling the purchase of EVMs. It is likely to decide within 15 days whether or not to purchase from Smartmatic. EC officials including Commissioner Ila Sharma have voiced concern over the purchase. Sharma said that she was left in the dark while initiating talks with the UK-based company. Lawmakers present at the EVM demonstration, were not sure that voters could use the machines properly. Smartmatic's soft ware-based EVMs are considered relatively safe compared to other EVMs but they are also highly expensive and require adequate voter education. "Nobody will disagree about using voter machines. But we cannot use such machines without farily extensive voter education," said Rukmini Chaudhary, chairman of Sanghiya Loktantrik Party. She stressed the need to factor in such education before deciding to purchase the machines. Lawmakers were worried whether the EC could educate voters scattered all across the country on proper EVC use within a short span of time and make sure that there would not be mistakes in voting. Chaudhary said most voters are not familiar even with smart phones and will not be able to cast their votes properly if EVMs are used. "I also use a smart phone but I got confused when I used it for the first time," she said. Nepal has already used EVMs in the constituent assembly polls in Kathmandu Constituency No. 1 and later in six constituencies for by-elections. The EVMs were donated by the Indian government.